Approximate amount of time to platinum: 40-60 Hours? Battlefield Hardline goes away from the military shooter we’re used to in the series and focuses on a cops vs criminals story. There is a 8-10 hour single player campaign in addition to a very robust online multiplayer that will be familiar to anyone a fan of the series with new modes that focuses on the cops and criminals along with some of the classic modes from the past. All but 3 of the trophies are earned in the campaign. Step 1 – Play campaign on Veteran difficulty, complete all case files and arrest suspects with warrants. 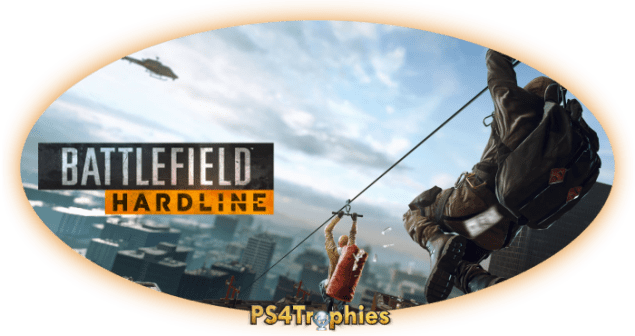 Step 2 – Clean up single player campaign trophies. In the event you missed any of the trophies in single player you can go back through episode select and get them. This applies to the collectibles, warrants or any trophy. You can lower the difficulty if the challenge is to high. Step 3 – Play game on Hardline Difficulty. Hardline is not available until after beating the game on Veteran difficulty. Hardline removes button prompts and gives enemies more health and damage increase against you. See Blue Eagle for more tips and information. Step 4 – Online Trophies. There are 3 online trophies. The Big Score simply requires you to win 5 games of Heist and 5 games of Blood Money; two new modes in the Battlefield series. There is a second trophy called Electric Company that requires 25 kills using the T62 CEW usuable by any class, however, you will need to purchase this for $21,000. The final online trophy is where you will need to do a bit of grinding. The trophy name is Menz in the Hood and the unlock requirement is rather simple. Get 25 kills with the MAC-10 and 25 Kills with the Double Barreled Shotgun. Neither of these weapons are available from the start so you’ll have to do a lot of grinding to unlock them. See the trophy description for those requirements. Story related, can’t be missed. In this episode there is 1 suspect with a warrant you need to arrest but that too, is part of the story. Story related, can’t be missed. There is 1 suspect with a warrant in this episode and 3 pieces of evidence for case files you will want to find. You will also want to look into earning the Motley Crew trophy in this episode. Story related, can’t be missed. There are 2 suspects with a warrant in this episode and 6 pieces of evidence for case files you will want to find. Story related, can’t be missed. There are 3 suspects with a warrant in this episode and 12 pieces of evidence for case files you will want to find. Story related, can’t be missed. There are 4 suspects with a warrant in this episode and 10 pieces of evidence for case files you will want to find. Story related, can’t be missed. There are no warrants or case files that you need to find in this episode. There are three trophies that you can earn while in this episode, Their Own Medicine, Knock Knock and Graceful Exit. Story related, can’t be missed. There are 3 suspects with a warrant in this episode and 9 pieces of evidence for case files you will want to find. Story related, can’t be missed. There are 2 suspects with a warrant in this episode and 9 pieces of evidence for case files you will want to find. During this episode you can earn the Hollywood Hideaway and BYOB trophies. Story related, can’t be missed. There are 2 suspects with a warrant in this episode and 9 pieces of evidence for case files you will want to find. Near the end of the episode you can earn Real Action Hero. Story related, can’t be missed. There are 3 suspects with a warrant in this episode and 4 pieces of evidence for case files you will want to find. You will also be on the lookout for the Social Climber and Dare Devil trophies. This can be earned as early as episode 1 during the section at the school. You’ll need to hit to equip it. You can then taze them but you will need to be fairly close as the range is quite limited. At any point in the game you can use the tactical boxes to change your equipment so make sure you keep this equipped until you got the trophy. Another easy location is actually in episode 5 when the police are looking for you. While not technically criminals, the policeman still count towards the trophy. You can sneak up beind a cop and do a takedown and hope he has a T62 or just loot the one out of the back of the police car that earns you the Their Own Medicine trophy. This is another trophy that you will get automatically while locating and arresting all suspects with warrants. While using your scanner ( ), scan all the criminals in the area. The guys with warrants will have a icon of a person appear and then all you need to do is press to analyze him. Alarm boxes will appear in enemy encampments throughout the game. You can easily identify them with your scanner and you will need to disable it without being spotted. If spotted, the enemies will sound the alarm and send reinforcements. There are many locations in the games with the alarm box so it should be to hard but the first two you will come across are in episode 3. Sneak up as close to the alarm as possible and take out any surround guys that may see you first. Just keep an eye on the mini map and you can see the criminal’s line of sight. This is be earned automatically if you are looking for all the evidence in the game as several of them will require you to use the grapple gun. If you just want to get this out of the way as quickly as possible, when you first acquire the gun in episode 3 and the game teaches you how to use it, climb up and then jump back down and do it again. You can earn this easily in episode 3, especially if you are acquiring all the evidence. In the Lake area, there are a couple locations with two towers. One of these towers is higher than the other. Use the grapple gun to get to the top of the highest tower and then use the zipline crossbow to reach the slighly lower tower that is further away. You can repeat the process a couple times between two towers until the trophy pops. Once you reach the school you will be on the rooftop and need to take out the scanner. First, as part of the story, you will need to tag and then analyze you informant. He’ll then walk to the front of the school and initiate a conversation with 2 people at the entrance to the school. Once he goes inside you will need to tag the two guys he was talking to, three guys on the first floor to the right of the entrance, a single guy on the floor just above the previous three and then another 3 on the second floor to the far left. After a moment you will have two vehicles pull up from the left side of the area. Between these two vehicles there will be 8 more men that you need to tag. The trophy will pop as soon as you tag the final criminal. This trophy is a little tricky and you’ll need to be quick. During one of the final sections of the game you will break into a vault after which you will have to survive waves of enemies. Once you survive you will zip-line out the of a building and you will be sent in some sort of free fall after an incident with a helicopter getting in the way. Almost immediately you’ll be facing the building and a few enemies will be on the balcony. You only have a few seconds to quickly kill one of these guys. I recommend equipping the Bald Eagle pistol with a RDS prior to this section. If you fail to kill one of the guys you can’t just restart checkpoint. You will have to pause and select “exit to menu” and then resume game from there and you’ll be placed right back in the penthouse. You can change your sidearm in the penthouse before making the zip-line off the building. There is a police cruiser located at far right end of one of the roads that will have a white circle on the truck indicating that you can open it. During your travels, you will approach a road where a cruiser will drive from the right to the left. Cross this street and the very next street you come upon is the one you’ll want to make it to the far right end. Be careful as there is a helicopter overhead and a couple nearby police officers. Open the truck and take the weapon to get the trophy. This will require you to complete the entire episode without being spotted. You can take out police by sneaking up behind them and doing a take down and you can also shoot them with the T62 CEW if you manage to acquire one as long as you weren’t spotted in the process. Take it slow and crouch whenever near the police. Sometimes you will do something where the police will suspect that you are in a specific area and that’s ok. You will know this when yellow circles appear on your mini map but you’ll have to quickly get to a new location as they will search that area. If at any time you are spotted, and you’ll know when you are, you can quickly hit restart checkpoint and try again. Halfway through the 5th episode you can come across a meth lab. You’ll know your close when you meet up with another prisoner who runs across the street. Follow him and you’ll go through a shipping container. It’s at this point you want to find a house at the right end of the road where you are told you can create a distraction opportunity. Go inside this house and go to the basement and turn on the gas and turn on the flame. It’s at that point you need to quickly leave the house. After making it out of the underground tunnels, you will find yourself at a trailer park. You need to get to the weapons in a trailer that’s located in the far opposite side in the middle. You can follow the outside wall to the left and jump up onto some rocks and hop over the wall. From here, you just want to quietly make it to the trailer. They’ll be an icon on your mini map indicating where you need to go. Use your distraction ability by tossing shell casings to force the inhabitants to look the opposite way whenever they are between you and your objective. Once you open the tactical box in the trailer the trophy will pop and you are free to shoot up the joint. There are two entry points into the house at the beginning of Episode 7. One is through the garage to the right and another is into the gym through a window on the left side. In the gym is where the hidden room is located but you will be unable to access it until the power is restored which happens automatically after you plant a bug on the third floor as part of the story. Once the power is on make your way to the gym being careful not to open the large nearby double doors which will take you to a new area. Inside the gym will be a couple criminals so take them out and along the wall near the doorway into the room is a hidden panel you can approach to open that will then open the hidden room. Don’t forget to get the piece of evidence that is also in this hidden room. The second area of episode 7 is called Terraces. In the back of this area just to the left of the tennis court is the chef grilling some steaks on a large gas grill. To earn this trophy you just have to shoot the grill to make it explode. The goal in episode 10 is to get to the large mansion. There are two trophies that can be earned by entering the mansion grounds in a specific fashion with the other being Dare Devil. The hidden access required for this trophy is to the left side of the mansion where you can shoot your grapple gun twice to reach higher platforms. To find this area, just stay left all the way from the beginning until you reach a dead end path with a single criminal hanging out. From there just look up to see your grapple gun shooting points. Finish the single player campaign on Officer or Veteran difficulty to unlock this trophy. See Blue Eagle for tips. Finish the single player campaign on Veteran difficulty. See Blue Eagle for tips. Hardline difficulty is unlocked after being the game on Veteran difficulty first. Each difficulty has more damage to enemies weapons and grants them further health. The key is to always try to arrest the criminals by sneaking up behind them all together. This will grant you a 250 points and level your character up which will grant you better weapons and gear. Another thing that is going to make things so much easier is knowing that you can literally bypass a large number of the enemies all together. I would recommend trying to take out most of them until you rank up to get better equipment but you can just sneak past many encounters entirely without taking anyone out. For example, you can complete the final mission in the game and never be spotted or take anyone out. For those times where you need to clear an area you want to rely heavily on your distraction by tossing shell casings. If you are to engage in a gunfight, make sure you are in cover as much as possible and use the lean by hitting . It won’t take much to kill you so limit the number of times you actually need to shoot it out. There are 22 suspects with warrants. You need to arrest each of these without killing them first. You need to first identify the suspects by using your scanner and once you’ve tag a suspect you will see a special icon indicating that he’s got a warrant for his arrest. You then need to hit the button to analyze the suspect to find out his name. Once you’ve done that you will need to carefully approach the suspect and arrest him without being spotted. If you are under active combat you will see your mini map flashing red. During this time you can’t arrest the suspect so you will need to hide for a few moments and wait until the map flashes yellow. If you find a tricky area and can’t reach the suspect you can freely engage in combat and shoot everyone else in the area and then wait until you are out of active combat at which point you can then go and arrest him. You can hit pause and see the current status of the suspects. One that has been arrested successfully will have a blue handcuff icon and one that was killed will have a orange death icon. The icon will not update until after you have reached the next checkpoint. If you are missing one, you can always go back through chapter select, just make sure to reach the checkpoint and make sure that icon is blue on the pause screen. Jumping the dirt bike into the mansion grounds is the second trophy related to entering the area. The dirt bike is actually cleverly hidden but you can find it near the Helipad. Look at the signs along the road for directions to the helipad. It can be a bit tricky so you can also just make your way to the Services Plant and know there is a path behind it leading up to the Helipad. Once near the helipad there will be a path leading towards the mansion. Follow it and there will be a dirt bike on the path after a 10 foot drop. Just keep an eye on the mini map and the icon will appear when you are very close. Once on the dirt bike just drive it forward and you’ll jump into the mansion. You are awarded points for all your good cop actions. You’ll gain 100 points for a normal takedown, 250 for an arrest and 1,000 for arresting a suspect with a warrant. If you try to arrest as many people as possible, which is the ideal strategy for surviving, you will probably reach level 15 several episodes before the end of the game. You should get this normally by playing the game but in the event you don’t, just go to episode select and play through any episode. There are 71 pieces of evidence you need to find to complete all 7 case files. These are collectibles within Battlefield Hardline. Completing each of the case files will reward you with new weapons and battlepacks. The battlepacks are bonuses that you can use in multiplayer. Finding the collectibles aren’t to difficult. Your scanner while reveal the direction and distance to the nearest piece of evidence. The only exception will be if the evidence is on the body of a suspect with a warrant. If you are missing one and there is no direction and distance then it has to be taken off a body. In these cases you will have to arrest the suspect and killing them will not allow you to search the body. You will simply need to win 5 Heist and 5 Blood Money matches in multiplayer. During this process you will want to start working on the other two multiplayer trophies and with time, you will win the required number of games. This is a weapon that will require you to purchase for $21,000. I would recommend equipping and getting this trophy as an Enforcer or a Professional to help rank up those classes for the Menz in the Hood trophy. This weapon will stun enemies but you will have to be pretty close in order for you to hit them. You can boost this by playing with someone who has these unlocked and part of their loadout. With someone in your squad who has one of these weapons in their loadout, have them kill themself (suicide by grenade works) and then you can pick up their professional or enforcer kit and proceed to get kills. When you die, you’ll have to pick up your partner’s enforcer kit again. You’ll have to mentally track how many kills of each you have. If you want to unlock these weapons permanently for your class, read on.You will need to unlock both of these weapons through a lot of grinding online. Once you have acquired them all you need to do is get 25 kills with each. Ranking up the Professional class to Bronze Service Star 7 and the Enforcer class to Gold Service Star 1 is the part that takes a long time. The more points you score in a match the quicker you’ll get these so just play to win by going after the objectives, getting kills, squad actions, spot enemies & score extra points with your gadgets. Let’s take a closer look at how to unlock both of these. The MAC-10 requires you to complete Professional Assignment 2. These are the steps to acquire it. Get reward by killing 10 people with snipers and 5 people with laser mines. You will now have Professional Assignment 1 Patch. Get reward by kill 25 people with snipers and 5 camera coins. You will now have Professional Assignment 2 and you can equip the MAC-10. Camera Coin Tips – You need 10 intel assists in a single match for this. You spawn with only 2 cameras but you can have up to 3 in the world. Place a 4th one and it will replace an existing one. This is easiest achieved in Blood Money as the everyone typically runs to the single money pile in the map. Go to the money pile and place two cameras as far away from the money pile as possible but with a line of sight to it. Don’t place it to close to the money because grenades will destroy them, in fact, further away the better. When you die, spawn and place a third one in the same area. Try to triangulate the area with cameras. Stay in this area but don’t shoot anyone because if you kill an enemy it will not count and your squad will spawn in on you. Your team has to get the kill. You will know when you got one because it’ll say intel assist on your screen. If you place them far enough away in corners facing the money, they shouldn’t get destroyed throughout the match. In a typical match, halfway through the other team will start hitting your vault. If you see the action going that way, place one camera facing the vault. This will leave you two at the money pile and one at the vault. This works best when the money pile isn’t in a tight area. To unlock the Double-Barrel Shotgun you will need complete the Enforcer Syndicate Assignment. This is far more complicated. Reach Enforcer rep level 4 in 10 separate matches. This resets every match. The hardest part about the Enforcer Syndicate is getting the reward. This requires you to reach reputation level 4 in ten matches. If you look at the image above which you’ll see on your HUD in the bottom right corner of the screen, you’ll notice four boxes. These are your current reputation perks. To the left of that is the progress bar to the next level. When you die, the progress bar resets to the beginning of your current reputation level and you raise it with score points you get. All reputation perks earned are permanent until the end of the match but they don’t carry over between matches. Each level will require more points to reach the next reputation level. Going from 3 to 4 takes an absurdly high amount of points and matches will end long before you reach it unless you are a top player. There are two ways that can make this “easier”. The first is to use Reputation boosters that you acquire from Battlepacks. They will either be 25%, 50% or 100% boosts to your reputation gain. The second way is to have someone else play as a hacker and they can use the Squad Upgrade on your squad and everyone in your squad will immediately achieve their next reputation level but this hack can only be used once at best every 4 minutes with a level 1 hacker. Remember to select your reputation bonus once you reach each level by hitting and using the right stick to highlight which of the two perks you want. To play as the hacker you will need to select it from the waiting for deployment screen by hitting to tab to Hacker and hitting to play as the hacker. Only one hacker is allowed per side. The hacker’s screen is simply a map with the subroutines on the left and squads on the right. Select the squad you want to boost by hitting or . That will highlight the squad leader on the map. Once highlighted, hit and select the Squad Upgrade box. You will now start a cool down of approximately 7 minutes under the subroutines column on the left. You can speed this up by selecting the overclock subroutine in the squad leader boost selection. Keep hitting this overclock as soon as it’s available. This will take off a few minutes on the Squad Upgrade cool down timer and you could even get lucky to have it overheat and it’ll be ready much quicker. There are upgrades to hacker that will reduce the cool downs on your abilities. As a hacker, I’ve fully upgraded an entire squad to level 4 in under 5 minutes. Hopefully at this point you’ll have both weapons and you just simply need 25 kills with each. On a final note, the reward requirement actions only start counting once you have them unlocked to earn. This means that getting a camera coin prior to Professional Assignment 2 won’t count towards the progress of the reward. This video shows some double-barrel shotgun action at the beginning and end as well as outlines each of the requirements to earn it as well as footage playing as the hacker. Thx! The change in the trophy level to me a perfect guide brought is wonderful. Because I’m Japanese, I’m not good at English, please permit. Completed all case files and finished story. still no trophy unlock. Help? !